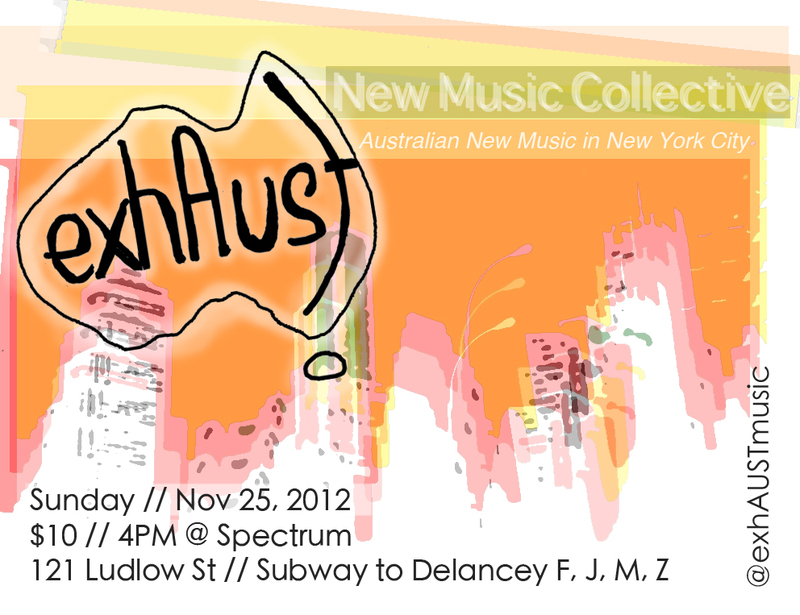 November 25th 2012, ExhAust @ Spectrum in SoHo, New York. In partnership with ArtsHub (www.artshub.com.au). Works by composers Julian Day, Lisa Dowling (also featuring on double bass), Tim Hansen, Aristea Mellos, Cyrus Meurant, Lachlan Skipworth and Chris Williams. October 18th 2011, ExhAust debut concert at the Galapagos Art Space in Brookyln. Works by Australian composers Julian Day, Nadje Noordhuis, Kate Moore, William Gardiner, Michael Sollis, Fiona Fraser and Tim Hansen.